‘Tis the season when gift-giving looms large in the mind… what to get that special someone/your mother-in-law/your hunting club buddies/the friend who illustrated your best-selling book? We’ve already offered a few Shakespeare-themed suggestions here on Shakespeare and Beyond, but here’s a find from the Folger vault to inspire you! A Midsummer Night’s Dream. Folger Shakespeare Library. PR2827 1868b Sh.Col. 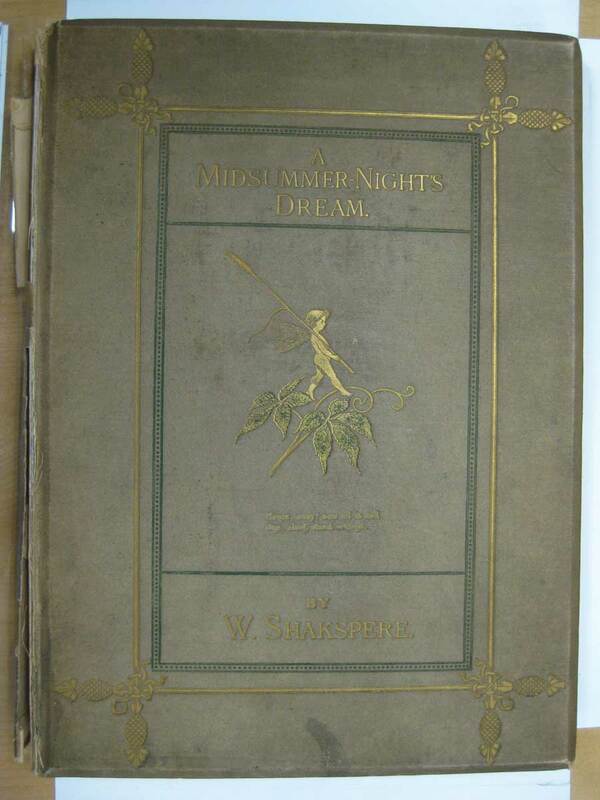 This lovely but worn edition of A Midsummer Night’s Dream was produced in 1868. It is illustrated by delicate cut-paper images created by artist Paul Konewka. Konewka, who lived in Germany in the mid-19th century, is known for elevating silhouettes and paper-cutting into an art form. He would cut silhouettes out of paper, then he or another engraver would transfer the resulting outlines to stone or wood blocks to create lithograph or woodcut illustrations for books. (For this edition, the images were engraved by Albert Vogel.) Konewka’s creations were very popular, and his Midsummer Night’s Dream was republished several times over the next few decades, including an edition in German. 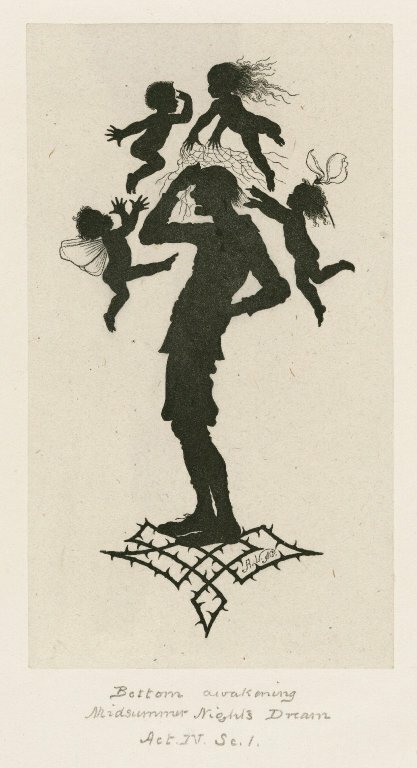 One of a series of silhouettes illustrating A Midsummer Night’s Dream / P. Konewka ; A. Vogel. Folger Shakespeare Library. ART File S528m5 no.80 part 18 (size M). Konewka’s edition of A Midsummer Night’s Dream was selected as a gift for another artist, John Tenniel. Tenniel was a well-known illustrator and political cartoonist, who contributed to the satirical magazine Punch for many years. 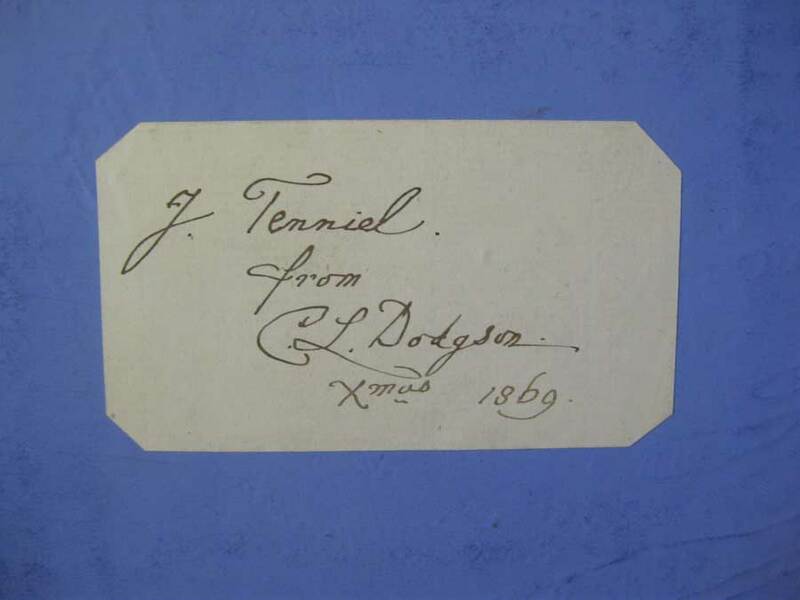 In 1869, he received this book as a Christmas present from his friend Charles Dodgson. A Midsummer Night’s Dream. Folger Shakespeare Library. PR2827 1868b Sh.Col. bookplate. Dodgson was an English mathematician, logician, and photographer, who studied linear algebra, matrices, and “recreational mathematics.” As you may know, he was most famous for his works Alice’s Adventures in Wonderland and Through the Looking-glass, published under the pseudonym Lewis Carroll, and illustrated by Tenniel. As Dodgson was preparing Alice’s Adventures in Wonderland for publication in 1865, he was virtually nobody, while Tenniel was a well-established artist. Dodgson, wanting high-quality illustrations for his book, hired Tenniel with funds out of his own (relatively small) pocket, a gamble that ultimately paid off: Alice’s Adventures in Wonderland would be a great success, and he would publish its follow-up story Through the Looking-glass, also illustrated by Tenniel, in 1871. In the intervening time, the men seem to have become friends – at least enough for Dodgson to give Tenniel this copy of A Midsummer Night’s Dream in 1869. Konewka’s papercuts might look familiar to you – an image of Bottom and Titania made an appearance on the Folger Instagram to celebrate Midsummer in July! In addition to several editions of A Midsummer Night’s Dream, the Folger also owns a standalone set of the twenty-four illustrations created by Konewka, which have been digitized and are available for your enjoyment. a fascinating link to lewis carroll! Queen Victoria had read Alice in Wonderland and she asked Lewis Carroll to give her a copy of his next book. This he duly did – a mathematical treatise. We imagine that perhaps she might have, on this occasion, been amused. Wow. A beautiful copy. This is my all time favorite Shakespeare play. Thanks for sharing. Queen Victoria enjoyed Alice so much, she asked Lewis Carrol to send her a copy of his next book. He did, it was a mathematical text book. I imagine that ‘she was not amused’.